In the Lok Sabha Polls 2019, the people of Nizamabad in Telangana will vote through Ballot Papers instead of EVMs. For the Lok Sabha Polls 2019 in the Nizamabad Lok Sabha seat, there are 185 candidates in contention. As one EVM can accommodate only 16 candidates and a maximum of 4 EVMs can be used in one polling booth, the Election Commission is forced to switch back to the age-old practice of ballot papers. Of the 185 candidates in contention 178 are farmers who cultivate Turmeric and Jowar. They are contesting polls to highlight their demand for the remunerative price for their crops. 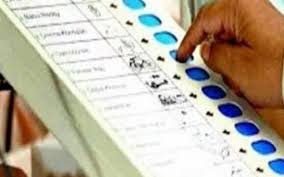 The Nizamabad Lok Sabha Constituency had received around 200 nominations of these some were rejected and 189 candidates remained in contention after the scrutiny of nomination papers. Of these 4 candidates withdrew their nomination papers. K Kavitha who is also the daughter of Telangana Chief Minister, Chandrashekhar Rao is the sitting MP from the Nizamabad seat. Q. In the Lok Sabha Polls 2019, the people of which consituency in Telangana will vote through Ballot Papers instead of EVMs?